"Delicate dark chocolate balls topped with a rich dark chocolate glaze." In a small saucepan over low heat, melt 2 squares of chocolate with 1/3 cup of butter. Stir frequently until melted; remove from heat, and set aside to cool. Preheat oven to 350 degrees F (175 degrees C). In a medium bowl, mix sugar, egg, egg yolk, and almond extract until light and fluffy. Stir in the melted chocolate. Combine flour and walnuts, and stir into the batter until just combined. Shape dough into 3/4 inch balls, and place them 1 inch apart on ungreased cookie sheets. If the dough is too sticky, refrigerate for 30 minutes before forming balls. Bake in the preheated oven for 8 to 12 minutes, or until firm to the touch. Transfer to wire racks immediately, and set aside to cool. In a small saucepan over low heat, melt 1 square of chocolate and 1 tablespoon butter together, stirring frequently until smooth. Remove from heat, and stir in vanilla and confectioners' sugar until well blended. Beat in the milk one tablespoon at a time until the glaze is of the desired consistency. Dip the tops of the cookies into the glaze, and allow to dry completely before storing in an airtight container. I made these cookie last night they were ok. I wanted to find a new cookie that would be a hit and this is it! I doubled the original recipe and added a few mini-chocolate chips. 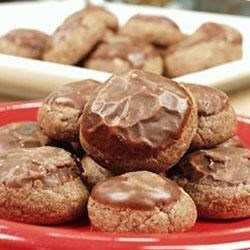 great recipe..the chocolate glaze adds a delicious touch..just put waxed paper or paper towel under the cookies after you dip them so they wont drip everywhere! It was either these or brownies, and I'm glad I chose these! The chocolate flavor was just right--my mom said they tasted "gourmet". Definitely a recipe to keep.